I'm excited to be one of the presenters for a Music that Makes Community (MMC) workshop in Des Moines, IA in late Sept/early Oct this year. This is a great event for two reasons. MMC does a great job of teaching the tools for paperless music to natural and trained musicians in a short amount of time. It is super affordable with the generous support of the Episcopal Diocese of Iowa. Only $100! And a bonus 3rd reason, is how inclusivity pervades as a core foundation of the work. Folks of other faiths/beliefs, no faith, seekers, and the "spiritual and not religious" are welcome to sing and hone their song leading craft. 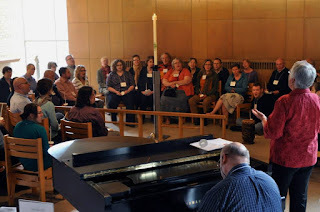 I have very fond memories of travelling to Grinnell, IA mid-summer of 2008 after reading a tiny blurb in Seeds for the Parish, a newsletter for ELCA lay staff, about a workshop using paperless music in worship. I recall having to re-read it a few times to make sure it was what I thought it was! I sort of understood the workshop was concurrent with the regional Episcopal clergy conference and felt a little intimidated being likely the only Lutheran church musician. It ended up that I wasn't, but our mind does funny things to protect us (even though it's rarely ever as bad as it makes it out to be!). Anyway, it didn't take long before I felt relieved that the blurb was what I thought it was and my awkwardness about not being Episcopalian melted away. Ecstatic was close on its heels as Ben Allaway led us through some magnificent call and response songs whose influences come from Africa. I have yet to figure out how he does it and can't wait to learn more songs from him. The Grinnell workshop must have been a day and a half, because I signed up shortly thereafter for the full three day workshop in Los Angeles later that fall (which leads to a whole different story of meeting Holly Phares, singing in Italy the following summer with a whole cast of wonderful people that I'm still in contact with today ... but another time!). Join us. It will be exhilarating. You will likely come face to face with some fears. You will also be surrounded by folks doing the same and cheering you on! I'm realizing this is the work of being alive.